Dog Bag is a range of stylish and flexible pet transport systems, designed for your pet's safety and comfort. 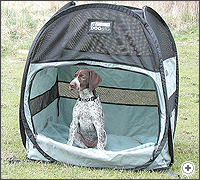 The brand, started with the award winning 'pop-up' portable fabric kennel of the same name. Designed to offer different benefits to the traditional steel cage - better comfort, more privacy, better sun protection when in the car, greater flexibility of use - Dog Bag is an exciting and intelligent concept in dog transport, protection and care. The Dog Bag was followed a year later by the Pet Tube. Developed using the same principles, but in a useful tube shape, it's the perfect option for where space is short - e.g. the back seat of a saloon car. This has been followed by a variety of pet transport systems and accessories, including messenger bags, small animal carriers, strollers, pet beds, mattresses, mats, dog jackets and more. There is something for every size of family pet. Dog Bag is a lightweight but super-strong 'pop up' fabric kennel: more comfortable than a dog kennel, less harsh than a dog cage, bigger than a dog basket, and the ideal pet carrier in the car. Available in four sizes it comes with a handy rucksack. Dog Bag uses integrated sprung steel loops to provide structure and stability, it packs into a small rucksack - small enough to hang inside on a coat hook, or to keep in the car. Compare this convenience to standard 'collapsible' cages and carriers which at best are about as handy to carry as deck chairs! Pet Tube, is a lightweight but super-strong fabric kennel, in the shape of a useful tube, which is ideal for saloon cars and when space is at a premium - it folds flat and is zipped shut when not in use. Available in Small and Large sizes, the Large size includes velcro straps to hold it at either 2/3 length or 1/2 length - ideal if you want to free up passenger seat space, and don't need to use your Pet Tube at full length. Dog Bag's Jet Set is not only the smartest but surely the kindest way to transport cats and kittens to friends, family, shows and of course to the dreaded vet. You can carry it at arms length, as a rucksack or over the shoulder, or use the multi-use straps to fix it to your car seats. It features privacy flaps to make the bag darker and more snuggly, as required, and scratch proof mesh doors to allow for security as well as plenty of ventilation. There is a useful range of accessories including a trolley, grooming bag and travel kit. Available in 3 sizes and 2 colours - original gold, or new Black label versions. The ergonomic Contour Messenger has been designed to be the ultimate in small pet carriers, seeking the optimum style and comfort for both pets and their owners. As its name suggests, it is shaped to fit your contours, with plenty of padding, making it comfortable to carry – slung around your back, on your side or in front of you. Your pet is lifted into the carrier from the top – no need to push it in and then close a door to prevent it coming straight out again. It features a lid with a mesh ventilation window and can be lifted up to form a “control tower”, with the pet looking out through the large mesh window, or else the lid can be folded out of the way, into a built in lid tidy; there’s a built in leash to stop the pet from jumping out. Available in 2 sizes in Orange/Silver or Black label versions. Dog Bag's USB - small pet carrier is a handy go anywhere travel bag that lets your friends come with you. Ideal for small dogs...but also great for cats, rabbits and more. Thanks to its incredible versitility, you may carry it as a hand bag or a shoulder bag, or use the multi-use straps and carry it as a rucksack, safe in the knowledge that your pet is comfortable and safe in its padded and hypoallergenic surroundings. It features window pads for good air circulation and a safety leash to prevent your pet from falling or getting out unintentionally. You can take it anywhere, on any vehicle - car, motorbike, mountain bike, etc - and there is a useful range of accessories including a rain cover, trolley and travel kit. Available in original silver, or new Orange/Silver and Black label versions. The Marsupack is a handy, over the shoulder, go anywhere travel bag for very small pets - kittens, small dogs, rabbits etc. It extends outwards to allow space for your pet to move around. Made by Dog Bag, it uses the same high-quality heavy-duty fabric material as it's big brother the Jet Set (see above). It's Unscratchable, waterproof, UV-protected and even keeps its normal folding properties to minus 25 degrees Celsius! The Dog Bag Home Comfort pet accessories range includes a variety of dog accessories designed to make your pet more comfortable at home aswell as on your travels. 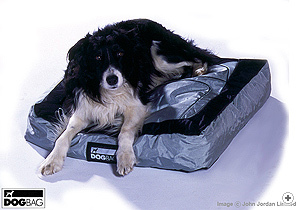 The 'Home Comfort' pet accessories range features special beds, mats and mattresses that are robust and beautifully made with fully fabric taped and double sewn seams, in silver and black 'High Density Fabric'. A stylish addition to any contemporary interior. A remarkable dog jacket that is available for dogs with backs sized between 30cm and 50cm. The 'Tiny House' and 'Little House' are small 'fabric kennel' homes for your little pets.